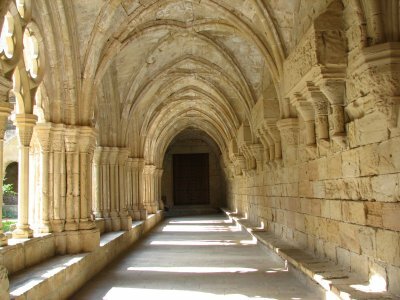 Poblet Monastery is one of the largest and most complete Cistercian abbeys in the world. It dates from the 12th century. It also is a massive military complex, and has served as a royal palace, residence and pantheon. We rented a car to go to Poblet from Barcelona, it took us about 1.5 hour to get there. The monastery's sharp, edgy towers make a pretty sight from a distance. We were there early (at 10 a.m., when it opens to the public), not many other cars on the huge car park next door. The entrance fee of 5 EUR includes a guided tour. They are only given in Spanish, Catalan and French - but we were provided with a booklet in Dutch and could tag along with a Spanish group. The friendly guide made sure that we got the main message of each part of the tour. The tour was a bit too hurried to our taste: we would have liked to stay in the various rooms a bit longer. My frequently professed affinity for sacred architecture did not translate into surpassing appreciation of Poblet Monastery. I saw an impressive enough complex which I could not call extraordinary. The historical context of the monastery's importance stayed beyond me. This was largely a function of the constraints of the visit. You can freely wander around the territory inside the outer walls of the monastery, but getting inside the main part of the complex is possible only roughly once an hour in the company of a guide. The tour is conducted in either Spanish or Catalan. If you indicate at the reception that you do not speak either language, you get a small booklet with explanations instead. Then, during the tour, you are allowed to explore on your own and not follow the guided group. Sounds like a pretty good deal for someone who dislikes crowds until you realize that the booklet throws historical facts at you and mentions key features of every space you see without tying it into a coherent picture. I am left wondering whether an ability to understand the tour guide would be key to get more value out of the visit. That being said, there are certainly some interesting features at Poblet Monastery that can be observed without any guidance. 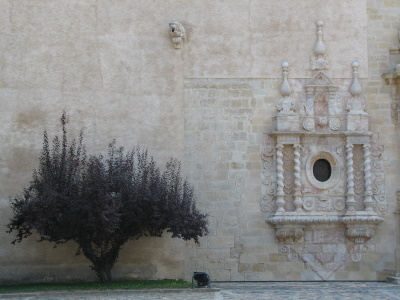 The most obvious of them is the façade of the main church, with a cluster of decorations on an otherwise blank wide wall. The façade opens onto Plaça Major, the wide main square of the complex which is accessible at no charge. Technically, you are inside the monastery when you are here. But the real visit starts only once you step through the gates of the innermost enclosure, which contains the church, the cloisters, and the monastic rooms. The cloisters, in my view, are not as impressive as the ones of the Tarragona cathedral, which I happened to visit earlier the same day. Plus, you are not allowed to step onto the central garden. But there is some intricate stonework and plasterwork all around. 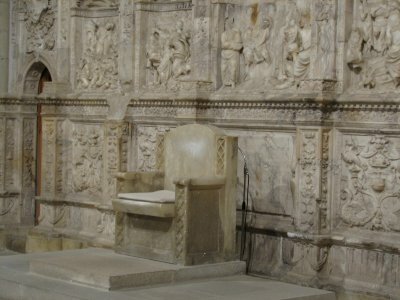 In the main church, the most memorable feature are elevated marble royal tombs. Beyond the church, your tour takes you through a number of spaces, some more impressive than others. The library appears – as is often the case – one of the most striking rooms in the complex, but you can only look at it through a glass door. There is some marvellous ironwork as well throughout the complex. You also step out onto an upper terrace and get a different perspective of the monastery towers. The tour of the monastery lasts about 45 minutes. 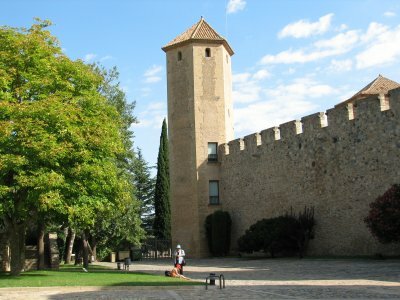 Poblet is about an hour and a half drive from Barcelona, or 40 minutes from Tarragona. If you time your arrival to quarter of an hour before the next scheduled tour, you may be able to see all there is to see in about an hour. Two hours is the most you’ll need for the visit, so it is definitely possible to combine Poblet with a day-trip to Tarragona from Barcelona. The Poblet Monastery is picturesquely located on a small hill between olive groves, you can see the panorama of its towers from afar. We came from Tarragona by car and when we drove down the street along the outer wall of the monastery we got a first impression of the size of the complex. With its towers, battlements and huge gates it looks more like a medieval fortress than a monastery. We arrived at a quarter past 11 a.m., a little too late for the regular guided tour, but we met a group from Switzerland and they invited us to join their guided tour. That wasn't bad, because the tour was in English, regular tours are in Spanish, Catalan, or French. First we went through two large gates and crossed two almost empty courtyards, then we had to wait for our guide in front of the Puerta Real, the inner gate flanked by two massive towers. The tour was excellent, the guide gave detailed information and we had plenty of time to visit all rooms, we spent almost two hours in the monastery. Although it is still an active monastery, large parts of the complex are open for visitors. We went through many corridors und stairs and even on the gallery on top of the cloister. 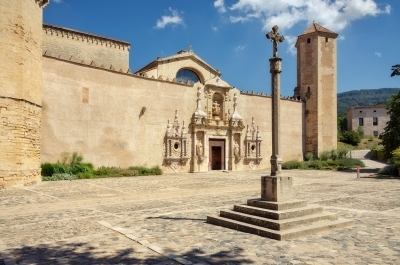 Poblet is a perfect example of Cistercian architecture and its aesthetic principles. No pomp or lavish decoration, but simple and functional architecture, large and high rooms with harmonious proportions. Wonderful examples are the refectory or even better the large dormitory with elegant supporting arches and the impressive length of 85 meters. The Gothic cloister has a ribbed vault and a lavatorium, it reminded me of the Cistercian monastery in Maulbronn. Obviously these are also characteristic elements. The capitals of the slender columns are decorated with floral motifs and abstract ornament. There are no mythical figures, saints or scenes from the Bible as it is characteristic of Benedictine monasteries. And there are also typical Cistercian elements in the church or rather the lack of elements is typical: no crypt and no apse, but straight walls in the chancel. But the highlights of the visit were the royal tombs in the transept and especially the magnificent Renaissance altarpiece made of white alabaster. 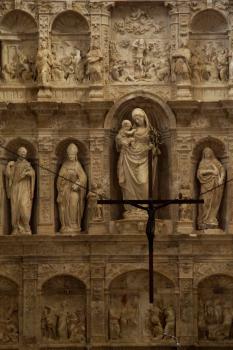 The altarpiece is a huge stone block with plenty of niches and sculptures and finely carved ornaments, a real masterpiece (photo shows a part). Poblet is one of the largest and most interesting monasteries I've visited so far. We finished our visit with a walk through the surrounding olive groves and we enjoyed the nice views of the monastery. I visited this WHS in May 2014. Since I was arriving late from Andorra I decided to sleep at Hostatgeria de Poblet which is actually inside the Poblet Monastery Walls and it's great value for money especially considering that you get a 3 euro discount to visit the monastery too. Although the monastery opens at 10am, I still woke up early in time to listen to the monks' vespers at 07:30. After that I hiked the Espluga de Francoli loop trail around the monastery walls which took me around an hour during which I passed through olive groves, vineyards and orchards. The views of the monastery from here are wonderful in the early morning light (photo) while the best time to take pictures of the Monastery entrance is in the afternoon. Prices have gone up and it now costs 10euros for a guided tour in Spanish or 7.50euros to visit without a guide, although you will still have to wait for the guide to open the door at 10.30am (very Spanish!) and follow the guide's instructions to how much time you're allowed in each floor before she closes the door. Overall, I had more than enough time to visit the monastery (around 2 hours) and follow the brochure in English however it's a bit of a pain that you can't exit before you reach the end of the tour and that you can't spend more time inside if you so wanted. The highlight of my visit was the walking trail around the monastery together with the chance to view the royal tombs of Aragon. This is definitely the largest and most complete monastery I have visited and the fact that it's still an active monastery is definitely a plus point. This monastery was well worth a visit. I discovered that certain buses operating between Tarragona and Lleida detour via the entrance to the monastery, and that it was possible to make an afternoon visit from Tarragona that way. The Cistercian monastery of Poblet is one of the more interesting and impressive buildings I have been to. The fact that it houses the tombs of a long line of kings and queens of Aragon in a great pantheon makes it especially noteworthy. Anybody coming to Catalonia should try to visit Poblet, located in the hills northwest of Tarragona, since you will hardly ever come across a better monastery anywhere. Having said that, however, you should either have a private car or join a bus tour, since reaching Poblet by public transport is very inconvenient, to say the least. I didn't really mind the 4-km walk from the nearest train station, since the weather was great even in late October, but I don't think many people would do the same (and there were hardly any signs).